Our fleet of Long Reach Excavator Hire offers 12, 15, 18 & 22 metre reach. All of the machines are factory built, have full specification sheets, bio oil and are CE certified. These are the only type of machines able to work for the environmental agency. Can be specified with an auxiliary hydraulic circuit. Here we have the Komatsu PC130 super long front excavator with over a 12 metre reach. This machine is ideal for dredging neglected rivers and streams to prevent future flooding. 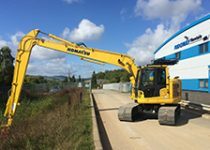 Komatsu 13 ton Long Reach Zero Tail Swing Excavator. This machine has a massive 12 metre reach with the added bonus of being able to work in confined areas due to the reduced tail swing. 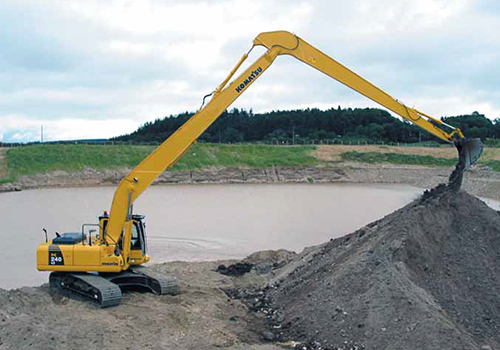 Our 15 Metre Long Reach Excavator Hire includes the Komatsu PC210 Super Long Front Excavator. 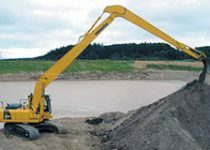 The ideal 20 Ton machine for waterway dredging, quarrying, digger work and slope working. Here we have a Komatsu PC240 super long front with an 18 metre reach. Ideal for dredging neglected rivers and streams to prevent future flooding. Our 22 metre Long Reach Excavator Hire includes the Komatsu PC350SLF. This 35 Ton Excavator boasts a 22 metre reach and is supplied with all the necessary CE certs and lifting charts that are necessary for environment agency work. 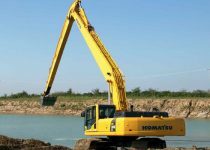 Our Long Reach Excavator Hire includes the Komatsu PC360SLF excavator. This 35 ton excavator boasts a 22 metre reach and is supplied with all the necessary CE certs and lifting charts that are necessary for environment agency work. for our best price on Long Reach Excavator Hire today! Our Nationwide Plant Hire machinery ranges from 1.5 ton Mini Diggers up to 50 Ton Excavators and include Long Reach Dredging Machines, High Reach Demolition Machines, Rubber Duck Wheeled and Zero Tail Swing, Loading Shovels (available in full waste spec), Telehandlers, Backhoes, Dumpers, Rollers, Dump trucks, Dozers and JCBs all available with many different attachments to suit purpose.